My wife and I had a wonderful visit to Punta Cana, our first time here. Jorge, the owner, was a wonderful help in answering all our questions and going the extra mile to help us with additional needs during our stay. His communication with us was excellent and prompt. Our deposit was returned to us before we arrived home. The condo itself was adequate for the two of us and the price a bargain. Being close to a market, several restaurants, and the beach all a big plus! Thanks to Jorge for a great value for our dollar. This is a quiet condo community located just a couple blocks from the beach. It is also located next to the El Dorado Shopping Plaza which is home to a well-stocked small supermarket, a lovely bakery with free WiFi, a pharmacy, pet store, salon and a variety of restaurants. There is a fruit vendor up the street and a man selling fish and lobster from his motorcycle passes through the area periodically. My husband and I rented a condo for a wonderful week of beautiful weather, rest and relaxation. It was easy to book excursions online and have them pick us up at the nearby market or bakery. There was even a salon nearby (Ruth Spa) where we enjoyed a couple’s massage for $30 each. This was particularly appreciated after our surfing adventure and horseback riding...yes we went twice in one week. The condo we rented was tastefully decorated and very comfortable (Homeway.com ~ #209894). The unit had free WiFi which was very convenient. The owner, Jorge, was responsive, honest and helpful in his communication. He provided maps as well as helpful recommendations. He resides in Florida but has property management in Punta Cana. Jorge also promptly refunded our rental deposit. If you’re looking for lodging near the beach but away from the often crowded resorts, I would highly recommend renting this condo in this area. Happy travels! Thank you, you'll bewelcome back anytime. Our stay at Jorge's place was GREAT!.....the location is next to this shopping plaza that has everything you need. The beach was a short walk away and it was simply amazing and so is the people, we had a great time. Thank you Jorge for been so honest and fast in returning our deposit. 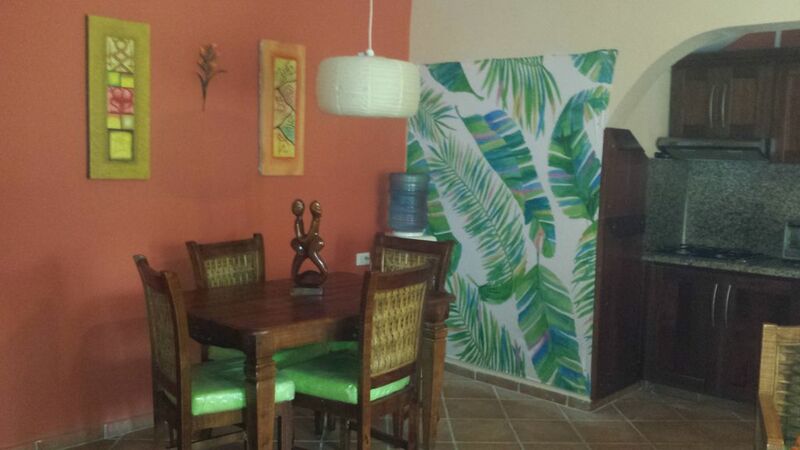 This privately owned unit is a fully furnished condo located on the ground floor in one of the 16 Mediterranean style villas at Grunwald II, a gated, exclusive private community at the entrance to Los Corales. A short walk to the beach with access to the Ricon Magico beach restaurant/bar, Bamboo Beach Bar and others. The apartment is located within a five minute drive from Palma Real Shopping Center featuring Tony Roma's and Hard Rock Cafe restaurants, in addition to a pizzeria and other restaurants, bars and shops. Also close by you will find casinos, nightclubs, golf courses, and tour companies. WE USE PAYPAL FOR SECURE PAYMENTS ONLINE, ACCEPTING MAJOR CREDIT CARDS.